Okay, so I am a wee bit late again for my Every Inchie Monday challenge this week. LOL, nothing new there then. Finally got it made yesterday though. The theme for this week is GLASS, and I decided to use sea glass for my little inchie. 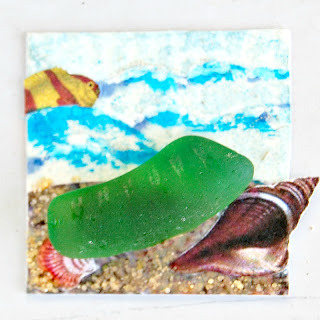 Must have had sea on my brain, probably because the Tag Tuesday challenges for this month have all been sea related. I used a couple of different light blue inks on the background, and then used the very edge of a dark blue one to create the waves. A white pen and a silver glittery gel pen were used for the crests of the waves, with a teeny fish gliding through them. 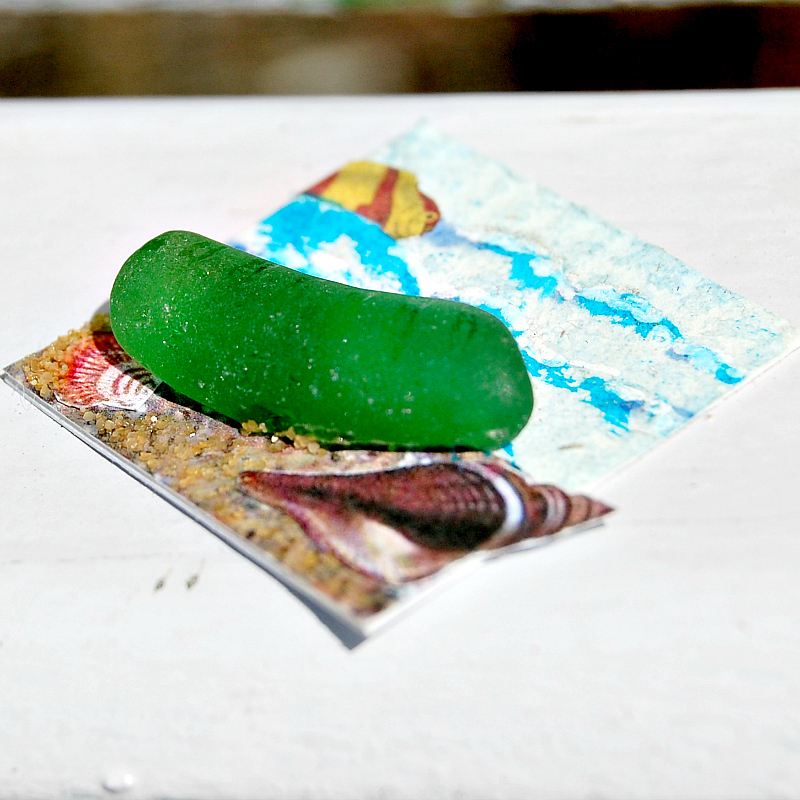 The beach is made from Distress stickles ( makes such good sand, I think, sparkling in the sun ). 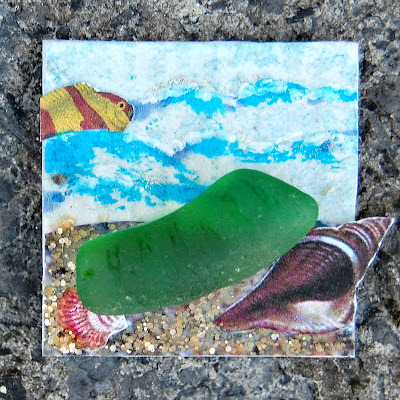 Couple of tiny shell images left over from tag projects, and of course the main thing, the piece of sea glass. 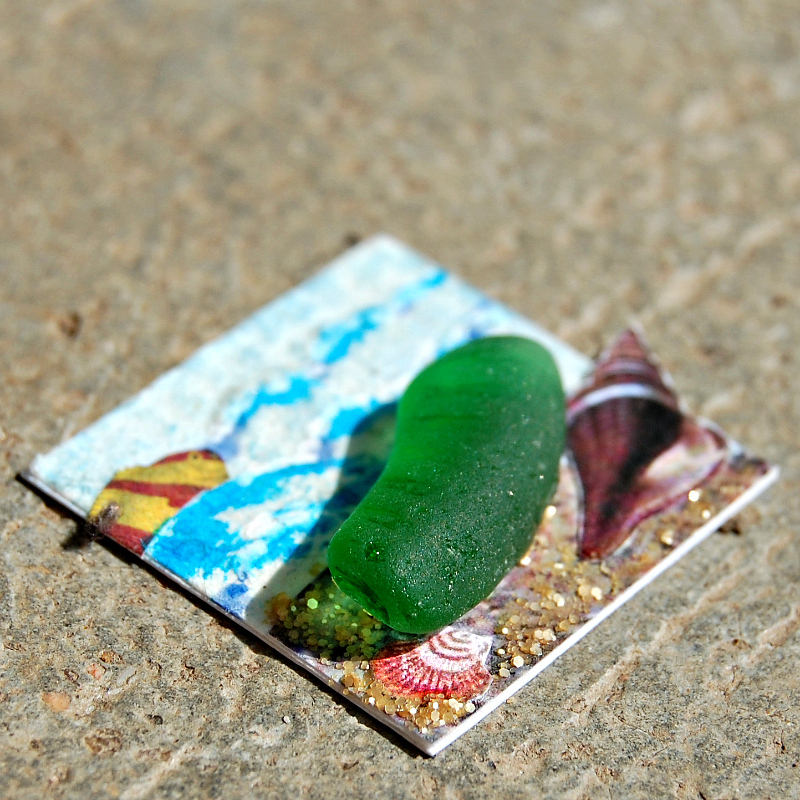 I don't often find sea glass on the beach, so this one is tiny but precious. Thats all for today, it is mightily hot here, 36C when I looked just now, and it is lunchtime. Gotta get stuck into my tomato and mozarella salad. The sea glasses are alwayes also difficult to find here,- Mathilde and I calls them our :"stones of luck" :-) I love your inchie with a stone of luck, and the beautiful sand and wawes- all so tiny and lovely. Here we have so HOT dayes also,now. Too cute! SUch a sweet memento. We used to live in Kodiak Alaska where there was a beach called "Jewel Beach". Wasn't much of a beach, but it was , you guessed it, covered in ''jewels''!! Lots and lots of sea glass and pottery shards. I often wondered where they came from..some shipwreck? We found some interesting things there, my fav was a solid rusted lock (so cool). Just one of the many things I miss about Kodiak.